We’re a special boutique located in the heart of Central Village of Westport, MA, that’s always stocked to the rafters with the very latest trends in fashion, jewelry and accessories. We’ve got clothing for simply any occasion at Deni’s Closet. Now featuring the latest in New York Metro and California looks. We also have clothing lines in miss and plus sizes, which include special occasion and wear separates. Deni’s is also proud to carry cruisewear year-round! We also offer a variety of distinctive gifts for all occasions. We’re open seven days a week, Monday – Saturday 9:30 to 5:30 and Sunday 11 to 5:00. For Sunday winter hours (January – March), please call the store at 508-636-0063. 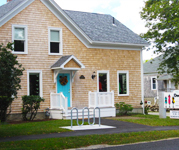 Get directions to our shop in Westport, MA, from our information page.